The Ecuadorian malacofauna is poorly known and the family Scolodontidae is not well-researched within South America. A new paper by Páll-Gergely & Asami (2014) supplies new data on both topics. 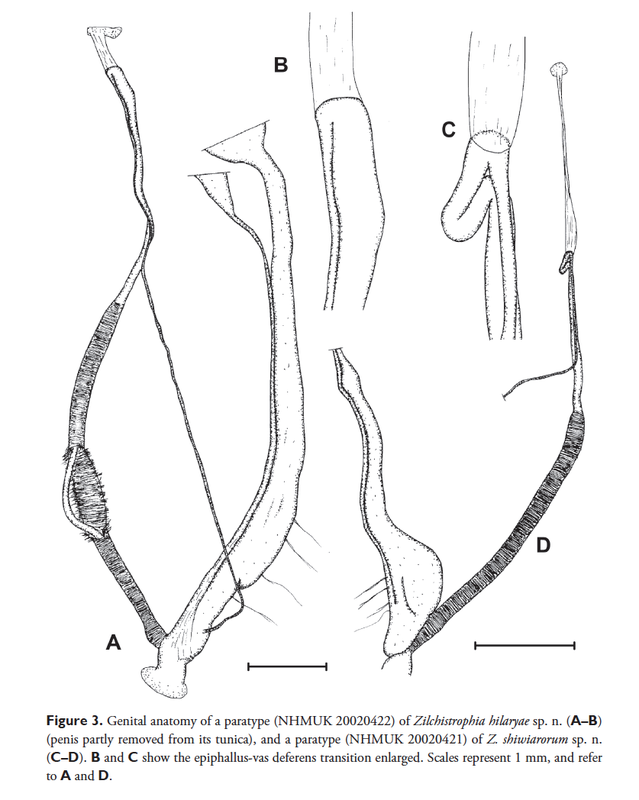 The abstract reads: “Two new species of the genus Zilchistrophia Weyrauch, 1960 are described from Eastern Ecuadorian rain forest: Zilchistrophia hilaryae sp. n. and Z. shiwiarorum sp. n. These two new species extend the distribution of the genus considerably northwards, because congeners have been reported from Peru only. For the first time we present anatomical data (radula, buccal mass, morphology of the foot and the genital structure) of Zilchistrophia species. According to these, the genus belongs to the family Scolodontidae, subfamily Scolodontinae (=“Systrophiini”). The previously assumed systematic relationship of Zilchistrophia with the Asian Corillidae and Plectopylidae based on the similarly looking palatal plicae is not supported”. The presentation of anatomical data for these two species makes this paper very interesting. The discussion of the systematic position within the family rests on relatively few data from the literature. Molecular data for this group are very scanty and are not given for this material, but having tried in vain to sequence orthalicid material from the same collector this leads to no surprise. Páll-Gergely, B. & Asami, T. (2014). Description of two new Ecuadorian Zilchistrophia Weyrauch, 1960, with the clarification of the systematic position of the genus based on anatomical data (Gastropoda, Stylommatophora, Scolodontidae). – ZooKeys 453: 1–17. This entry was posted in Uncategorized and tagged ecuador, literature, scolodontidae, taxonomy, types on March 4, 2015 by bramb.